2011. Ink on paper. 9.5 x 6.25 in. This image-text pairing originally appeared on VerySmallKitchen as part of a 3-month online residency. 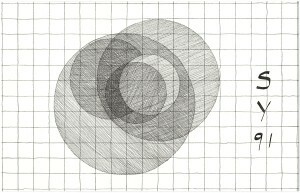 This entry was posted in Excerpts, Images from Excerpts: Diagrams, Titles from Excerpts: Nathaniel's Perpetual Motion, VerySmallKitchen and tagged art, diagram, drawing, fiction, geometric, narrative, press, push, residency, up, verysmallkitchen. Bookmark the permalink.